Because no two individuals have exactly the same expectations and desires, conflict is a natural part of our interactions with others. After all, two people can't be expected to agree on everything at all times. We've all seen situations where different people with different goals and needs have come into conflict. There can be various reasons for conflict, be it at home or workplace - prejudice and discrimination, bullying, jealousy, failed relationships (friendship or romantic relationships), gossip, fear or confusion. And we've all seen the often-intense personal animosity that can result. At times, it feels like staying in the same room is difficult let alone achieving a win-win situation! 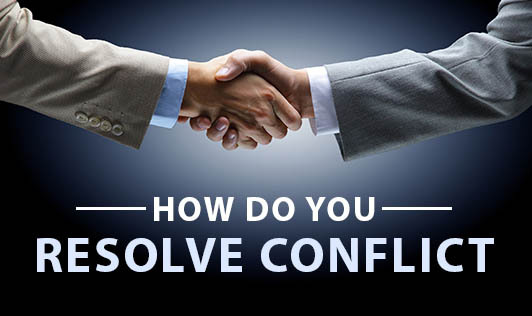 The fact that conflict exists, however, is not necessarily a bad thing: As long as it is resolved effectively, it can lead to personal and professional growth. When conflict is mismanaged, it can harm the relationship. When handled in a respectful and positive way, conflict provides an opportunity for growth, ultimately strengthening the bond between two people. • Cooperativeness - the extent to which the person attempts to satisfy the other person's concerns. 1. Competing is assertive and uncooperative-an individual pursues his own concerns at the other person's expense. This is a power-oriented mode in which you use whatever power seems appropriate to win your own position-your ability to argue, your rank, or economic sanctions. 2. Accommodating is unassertive and cooperative-the complete opposite of competing. When accommodating, the individual neglects his own concerns to satisfy the concerns of the other person; there is an element of self-sacrifice in this mode. 3. Avoiding is unassertive and uncooperative-the person neither pursues his own concerns nor those of the other individual. Thus he does not deal with the conflict. Avoiding might take the form of diplomatically sidestepping an issue, postponing an issue until a better time or simply withdrawing from a threatening situation. 4. Collaborating is both assertive and cooperative-the complete opposite of avoiding. Collaborating involves an attempt to work with others to find some solution that fully satisfies their concerns. It means digging into an issue to pinpoint the underlying needs and wants of the two individuals. 5. Compromising is moderate in both assertiveness and cooperativeness. The objective is to find some expedient, mutually acceptable solution that partially satisfies both parties. It falls intermediate between competing and accommodating. Each of us is capable of using all five conflict-handling modes. None of us can be characterized as having a single style of dealing with conflict. But certain people use some modes better than others and, therefore, tend to rely on those modes more heavily than others-whether because of temperament or practice. • Learn to listen - When it comes to effective conflict resolution, how effectively we listen is at least as important as how effectively we express ourselves. It's vital to understand the other person's perspective, rather than just our own, if we are to come to a resolution. In fact, just helping the other person feel heard and understood can sometimes go a long way toward the resolution of a conflict. • Communicate! Communicating your feelings and needs clearly is also an important aspect of conflict resolution. As you probably know, saying the wrong thing can be like throwing fuel on fire, and make a conflict worse. • Leave the past incidents behind - Bringing up past experiences not only makes the person feel hurt and unforgiven, it also does not help arrive at any solution. Try to stay with the current situation and arrive at a solution in a constructive manner. • Know when it's not working - Try to understand and change when techniques used before are not working. One technique used in the past with one person may not work with another in a different scenario. • Non verbal communication plays a big role in conflict resolution - A hug, a smile, a handshake, and a nod can be extremely vital in any relationship where there is presence of disagreement or conflict. Simple nonverbal signals such as a calm tone of voice, a reassuring touch, or an interested or concerned facial expression can go a long way toward relaxing a tense exchange. • Use Humour! You can avoid many confrontations and resolve arguments and disagreements by communicating in a playful or humorous way. Humour can help you say things that might otherwise be difficult to express without creating an awkward situation for everyone concerned. However, it's important that you laugh "with" the other person, not "at" them. • Be willing to forgive - Resolving conflict is impossible if you're unwilling or unable to forgive. Resolution lies in releasing the urge to punish, which can never compensate for our losses and only adds to our injury by further depleting and draining our lives.